I am updating this post and I will be off to my friend’s place so we can get ready for tonight’s event. I painted my nails with Chanel’s nail polish in vamp. A color I would recommend wearing during cold weathers.You know you can’t go tout noir if you decide to wear your little black dress. 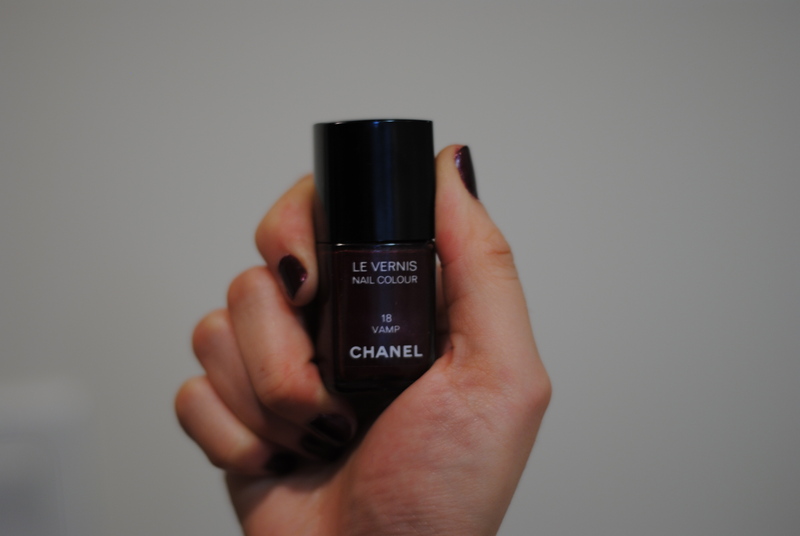 If you go for Chanel, might as well go for the classic: get a bottle in vamp. I love the sheen in this color and if you put your fingers close to light, you get the satin texture look on your nails. Also, who can forget Uma Thurman’s image in Pulp fiction? She looks HOT in Vamp. I have no idea why my hand looks so pink in the first picture. It might be the lighting. This is what’s so addicting about this color: in darker places it looks almost black, but when you go under the light, you can identify it as burgundy. Speaking of burgundy, I also love a very beautiful burgundy color by OPI, the nail polish came out in the Russian collection back in 2007. The color is called St. Peters-burgundy. Believe it or not, I am still using it and it is still very good, didn’t dry or become tacky at all. Another color in the collection is called in Midnight in Moscow, it is similar to Vamp, but has more sparkles. Both colors are really pretty and timeless. I love how details really finish up a look. Painting your nails in Vamp, definitely does the job.